VisualSMP is a suite of tools used in the prediction and analysis of a ship's sea-keeping and loads characteristics. Included in VisualSMP is the US Navy's strip theory based ship motion program (SMP), US Navy's sea-keeping analysis program (SEP), US Navy's standard time history program (STH and ACTH), and US Navy's sea-keeping program for SWATH (SWMP). VisualSMP has a graphical pre- and post-processor, together with tools to extend and refine the functionalities of SMP. VisualSMP is an easy-to-use and reliable tool for predicting ship motions and loads for mono-hull, SWATHs and regular catamarans and graphically evaluating the calculated motions. 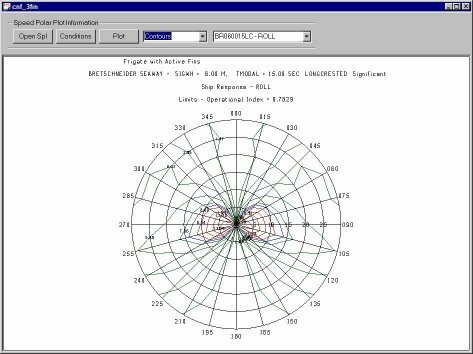 VisualSMP is also a unique tool for evaluating ship motion reduction measures such as bilge keels, rudders, fixed fins, controllable fins/rudders, moving weights and various anti-roll tanks. US Navy's SMP was the very first strip theory ship motion program. It is a product of more than 30 years of US Navy's research, from late 1960s to late 1990s. In 1999, US Navy selected Proteus Engineering, which was later acquired by Alion Science and Technology, to make it more user- friendly and available to commercial customers. In addition to creating a graphical pre- and post-processor interface, Alion Science and Technology has added many new features to VisualSMP to extend and refine the functionalities beyond the original SMP. Alion Science and Technology is constantly updating and improving VisualSMP to reflect the most recent ship motion research and developments in US Navy, Alion and the industry as a whole. We are committed to keep our program to be the best of its kind and to provide the best technical support to our customers. VisualSMP calculates 6-DOF rigid body motions, absolute motions of any specified points and the relative motions of specified points relative to waves in both regular and irregular waves. The irregular seas are modeled using either the two parameter Bretschneider, the three parameter Jonswap, or the six parameter Ochi-Hubble wave spectral models. Both long-crested and short-crested results are provided; short-crested waves are generated using a cosine squared spreading function. Motion outputs include displacements, velocities and accelerations. Load outputs include vertical and transverse shear forces, longitudinal and horizontal moments, and torsion moments at user's specified locations. Output for regular waves is in the form of RAO and/or transfer functions. 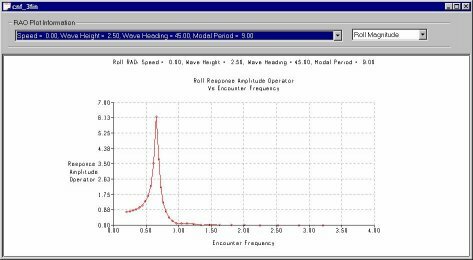 Outputs for irregular waves are response spectra and various statistics that may be used in ship design and performance assessment. 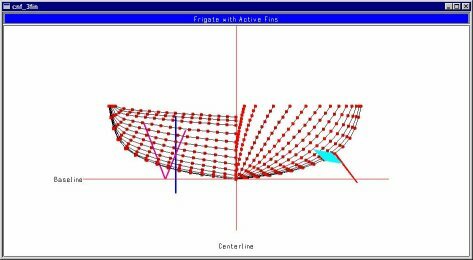 VisualSMP will calculate the probabilities and frequencies of submergence, emergence, and/or slamming occurrence, slamming pressure/force, MSI (motion sickness incidence) and MII (motion induced interruptions, i.e., tipping and sliding) for various locations on the ship. It also estimates added resistance in waves. Based on the user specified motion limits and criteria, VisualSMP will calculate the Operation Index (OI) for all the speeds/headings or a subset of speed/heading combinations. VisualSMP outputs tremendous amount of data in text files. To present these data logically and graphically, VisualSMP has convenient plotting tools to produce high quality 2D and polar plots. Alion has developed the graphical pre- and post-processor using the Microsoft Windows GUI. These tools speed the data input process and provide graphical tools to view the computed results. VisualSMP input models consist of hull offsets, appendage dimensions, and controller coefficients. The hull offsets are described to the system as points on sections, including the stem and stern profile. Both transverse and longitudinal knuckles are allowed. New Versions of VisualSMP feature powerful geometry input and manipulation utilities. These utilities make preparing offsets almost an automatic process. The user may import the offset table from FASTSHIP in an IDF format, or prepare the offsets in a GHS GF style text file. The offset points may go above the waterline. After IDF or GF file is imported into VisualSMP, the user can use 'Modify Sections' to clip the sections to a particular waterline, and then use other utilities to make point distribution to the user desired level section by section.The user may input up to 70 stations and 70 points per station, and may choose from the following list of appendage types to include in the calculations: Sonar Dome, Bilge Keels, Passive Fins, Active Fins, Shaft Brackets, Propellers, Propeller Shafting, Skeg, Rudders, and Roll Tanks. In addition to the many text output files, VisualSMP presents its output in plots in the forms of RAO plots and speed polar diagrams. The polars show the ship's response for any motion/load as a function of speed and heading, and can also show the effect of an imposed limit on the ships operation. When the ship's motion/load has exceeded a user-defined limit on one of the motions, the contours for those speeds and headings are drawn in red to highlight the limit of operation. These response contours can also be presented vividly in a continuously color-coded (or color-filled) polar plot. The user can also specify a set of operations limits on various motion/load responses and VisualSMP will calculate the operational index based on these limits. Polar plots are recently extended to various statistics values of every ship motion and load responses: the Band-width, the Most Probable Maximum Response, the Zero-Crossing Response Period, the Average Response Period, the Probability of Exceeding A Specified Value, the Number of Occurrence of Exceeding A Specified Value. Among many other things and past improvements, the most recent Alion additions and improvements are: (1) A suite of utilities to easily modify, refine and prepare the hull geometry; (2) Fully functional Ochi-Hubble family of wave spectra; (3) Motion and relative motion time histories outputs for short-crested waves; (4) Calculating the cargo latching forces at the specified deck surface and point in both long-crested and short-crested waves; (5) Quasi-nonlinear roll restoring force, i.e., using the actual GZ curve in transverse motion and loads calculations; (6) Calculate and output of the response band widths; (7) Calculate and output of the Zero-Crossing Response Period and the Average Response Period; (8) Calculate response statistics, such as the Most Probable Maximum Response in a specified length of time, based on the response's actual band-width instead of using narrow-band assumption; (9) Calculate the probability of exceeding a certain response (motion or loads) level in a specified length of time based on the response's actual band-width; (10) Calculate the number of occurrences of exceeding a certain response (motion or loads) level in a specified length of time based on the response's actual band-width; (11) Calculate the probability of exceeding and number of occurrences of exceeding a certain response level for a mission profile, which will include all the speeds and headings for various different combinations of wave heights and wave periods. The Sea-keeping Evaluation Module (SEP) can be used to estimate the seaworthiness of SWATH and monohull ships early in the design process. Estimation of the seaworthiness of ships can be useful in several ways. In early design studies, prediction of the effect of hull form modifications on ship motions can have an impact on the design, permitting the selection of a seaworthy hull form, from among those which meet other design requirements. The ability to readily analyze the relationship between hull form modifications and seaworthiness can allow consideration of many hull forms in a short period of time. Once a ship has been built, estimation of seaworthiness utilizing frequency domain prediction methods can facilitate prediction of the potential ability of the ship to carry out a new mission. This facilitates consideration of the effect of hull form modifications on performance. There are three major components used in the sea-keeping evaluation; the rigid body motion transfer functions for the particular hull form, the data describing the probability of occurrence of various sea conditions, and the sea-keeping criteria which describe the degradation of performance due to ship motions. The transfer functions must be generated using VisualSMP regular wave modulefor mono-hull ships or SWATH module for SWATH ships. Required input data for the SEP includes motion transfer functions which have been generated by either the SWATH module or SMP regular wave module as well as data files which contain results from analysis of Spectral Ocean Wave Model (SOWM) data. This data defines the joint probability of occurrence of significant wave height, spectral modal (peak) period, and wind speed for various geographical locations. Although there are limitations to the analysis used in SEP, it provides the means of easily, quickly, and consistently estimating the seaworthiness of hull forms for a range of missions, giving consideration to a wide range of spectra and their probabilities of occurrence at a large number of geographical points. This method of predicting seaworthiness is useful in comparing the performance of a variety of hull forms. VisualSMP 's STH module uses transfer functions to generate time histories for the waves and the vessel 6DOF motions in irregular seas as well as the time histories of motion and relative motion of any points. Both the numerical time histories and the cosine coefficients for use in visualizations and simulations are computed. VisualSMP 's STH module not only generate time histories for long-crested waves but also for short-crested waves. If the user specifies the normal of a deck, the STH module will calculate the cargo latching forces at the specified deck point in both long-crested and short-crested waves. 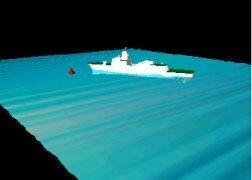 The VisualSMP visualization program uses the cosine coefficients and a geometry model from an IDF mesh file (for example from FastShipT) to simulate the ship in a seaway at a fixed heading and speed. The simulation may be run at real-time, or at a processor-dependent speed. The model may be rotated and viewed from any angle, and reference points (buoys) may be defined to help visualize speed. The user's view may be either global (off the ship) or from the bridge. Copyright © 2010 Alion Science Inc. All rights reserved.